Samsung Galaxy S4 First Image Revealed: Just two days after the official launch of its new flagship, Samsung shows the first image of the Galaxy S4 expected on Twitter. 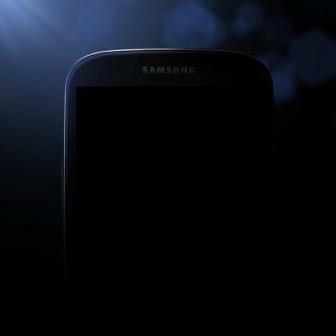 This is a rather dark picture only shows a detail of the design lines of the new ‘smartphone’, similar to the Galaxy S3. Samsung is all set for its Unpacked 2013 event in New York. So far few details about the event have seen the light. Last week we presented the first part of the promotional video of the event, in which a child had been chosen to save a package that included the new ‘smartphone’ of South Korea. On Monday, the promotional video continued with a second part in which the same child, named Jeremy, finally saw what the new S4 Galaxy. Until yesterday everything pointed to the rest of us should wait until Thursday to see the features and design that Samsung has included in its new ‘smartphone’. But hours after pitching the second part of the video Samsung hung in one of its official Twitter accounts the first image of the new S4 Galaxy. In a dark and where only you can see the rounded lines of its design, the new S4 Galaxy bears some resemblance in design to its predecessor, the Galaxy S3. Will have to wait until Thursday to see in all its glory the new ‘smartphone’ of the South Korean and check the features so far are true or not filtered. Samsung will introduce the new S4 Galaxy at an event in New York on Thursday, which may be followed by users through its official channel on Youtube. Also, for those users who are in New York can follow the event through one of the giant screens in Times Square.